Bottle # 2528 sold empty at ebay. Beeswax, yellow apples, dried apricots. Fog, wet autumn leaves. Dandelion. Camomile tea. A touch of coconut milk. Oily, spicy. Butter biscuits, black pepper, a little chili. Olive oil. Baked pumpkin with caramelized walnuts and some sage. Wonderfully heavy sooty sweetness, metallic accents, freshly squeezed lemon juice, salt, subtle herbal tones, ferns and increasingly honey-king. Typical inverness style. With water: saltier, noticeably citrus-toned and grassy. Later again honey. Extremely oily onset, waxy aromas, honey-like sweetness, salt, some soot, metallic accents, oak and earthy ginger note. In the background lemon juice and grass. Medium. Honey-coated nuts, metallic aromas, salt, grassy accents and hints of valerian and cough syrup. Flavor development. Medium dry. Sooty. Smoky oaky. Sappy. Orange pith and zest. Surprisingly lively, spicy. Faintly medicinal. I wish I was older and would have been able to purchase this when it was released... Now it's simply too expensive. But excellent it is also! Very pleasant, floral and fruity. Heather and lavender come to mind first, then hay, malted barley, husks, honey, lemon juice, melon, and apricot. There is also a little woodiness, with sawdust and vanilla. With water: gets a little earthier with licorice root and cough syrup. Hot when undiluted, yet still pleasant with the same floral and fruity character. It has a sweet feel, with a little sour edge of citrus. With water, it develops to a lovely, almost syrupy dram. It's very delicate, floral and fruity. Lavender honey, beeswax, peach, melon, apple and lemon prevail. Then, the malt, cough syrup, vanilla and a little wood smoke complete the senses. Towards the end, it gets pleasantly drying with a dash of pepper. The finish is long, with more pepper now, and a bigger role for the licorice and cough syrup. Next to that, some aniseed shows. The fruit has almost vanished, but the floral and malty side stays. 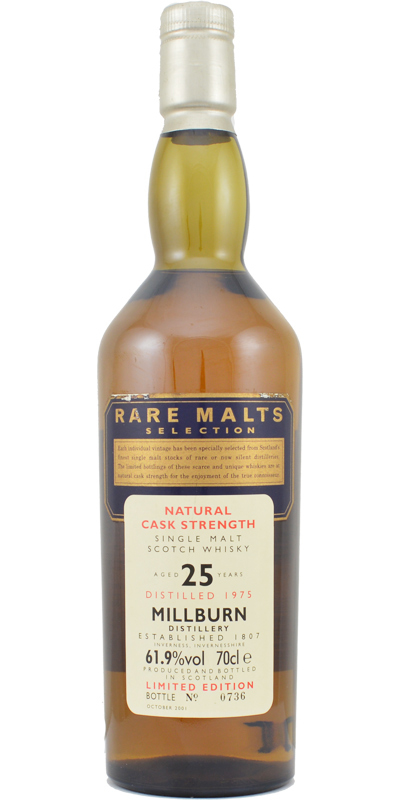 As a Rare Malt should be strong in ABV. Add water. Again malt, but dominated by citrus.